Zuccotta, the Mediterranean style restaurant and bar in Cobham, has the solution for those seeking a warm and sunny interlude. 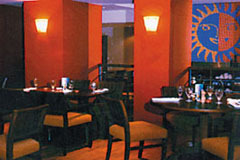 The rich, vibrant décor alone makes the bar and restaurant feel a few degrees warmer. A menu of authentic Mediterranean dishes inspired by sparkling summer seas and blue skies. Open every day for breakfast, lunch and dinner. All major credit cards accepted. 10% service charge. Authentic Mediterranean dishes with vegetarian options.